Boston is a giant history museum, the setting for many educational and lively field trips.Cobblestone streets and costume-clad tour guides bring to life the events that kids read about in history books. Hands-on experimentation and interactive exhibits fuse learning and entertainment. USS Constitution &Museum Aside from exploring the warship, kids can swing in hammocks and experience life as a sailor. Massachusetts State House Check out the Kids’ Zone on the website. It features word games, trivia quizzes and the priceless Ladybug Story, a story of how a group of kids used the legislative process to make the ladybug the official bug of Massachusetts. Old South Meeting House Scavenger hunts and activity kits direct children’s exploration of the historic building. Old State House Most of the exhibits are not particularly kid-friendly, but the ‘Hands-on History’ exhibition allows kids to build with blocks and peek behind the hidden doors of the State House facade. Prudential Center Skywalk Observatory Assuming your kids are not acrophobes, they will be thrilled to see Boston from above. A special audio tour caters to little ones. Museum of Fine Arts Offers loads of programs for kids of all ages. For example, Family Place (open Tuesday and Thursday) teaches children over age four to use art, music and poetry to explore the gallery’s collections. Every second Monday there’s a program for toddlers, and different series of Saturday classes target kids and teens. Institute of Contemporary Art (ICA) Innovative programs for families include Sunday afternoon art classes and monthly ‘play dates,’ as well as a supercool program organized by teens for teens. Museum of Science More opportunities to combine fun and learning than anywhere in the city. Most of the museum is good for older children and teenagers, while the Discovery Center is designed for kids under eight. New England Aquarium Special hands-on exhibits give kids the chance to pet sharks and rays or even pick up a starfish or a sea urchin. Toddlers will appreciate the toys and activities in the (minute) Curious George Discovery Corner. designed specifically for toddlers under the age of three. Franklin Park Zoo The zoo often hosts special events (eg, Little Joe the gorilla’s birthday party) that children adore. Otherwise, the hands-on exhibits like Franklin Farm and Aussie Aviary let them get up close and interact with the animals. Harvard Museum of Natural History It’s almost as good as the zoo. Sure, the stuffed animals don’t move, but they let the kids get really close and look them in the eye. Nature story hours target young audiences. MIT Museum It’s too complicated for small kids, but teenagers will get a kick out of the robots, holograms and other science stuff. Boston Harbor Islands Spectacle Island has family-friendly facilities (and beach), while Georges Island has Fort Warren, which is fun for older children to explore. Check the website for lots of kid-oriented activities on weekends. Castle Island & Fort Independence Lots of run-around space and a fort to explore, plus beaches and playground make this an excellent adventurous outing for kids. New England Aquarium Whale Watch The boat ride can be a thrill, and whale sightings are practically guaranteed. That said, they are not usually very close, and it can turn into a long trip for smaller children. 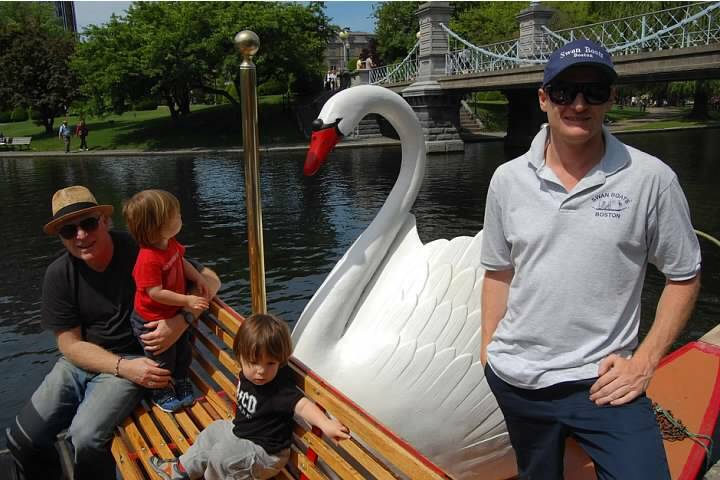 Swan Boats Boat rides on the Public Garden lagoon are short (15 minutes) and sweet (read: tame). Perfect for little tykes, but perhaps boring for older kids. Boston by Foot ‘Boston by Little Feet’ is the only Freedom Trail walking tour designed especially for children age six to 12. Boston Duck Tours Kids of all ages are invited to drive the duck on the raging waters of the Charles River. Bonus: quacking loudly is encouraged. Freedom Trail Foundation Older kids will appreciate the guides in costume. Download a scavenger hunt or a reading list for your child before setting out. Urban AdvenTours This bike tour is great for all ages. Kids’ bikes and helmets are available for rent, as are bike trailers for toddlers. Quincy Market There are always jugglers, puppeteers, break-dancers and acrobats performing on weekends at Quincy Market. Boston Symphony Orchestra The BSO has a rich ‘Youth & Family’ program, with weekend concerts that are designed specifically to introduce young people to classical music. Come early for instrument demonstrations and other interactive fun. Recommended for ages five to 12. Improv Boston Improv Boston presents The Family Show on Saturdays at 6pm. Kids aged four and up get to watch and engage in improvised song, dance and fun. Coolidge Corner Theatre Sunday morning movies especially for little people. Mugar Omni & Simons IMAX TheatresNature and science come to life at these multi-sensory cinematic experiences. Charlesbank Playground AKA the Esplanade playground. Boston Common Playground Bonus: summertime spray pool on the Frog Pond. Stoneman Playground Two gated areas target different age groups. Cambridge Common Playground Swings, climbing structures and ramps. Boston Central is a fantastic resource for families, with listings for activities, outings, shops and playgrounds that are good for kids. Look for the icon in the listings indicating family-friendly restaurants, shops and hotels. Kids under 11 ride the T for free, while junior high and high school students pay half-price. Most taxi companies can provide a child seat if you reserve in advance. Most upscale hotels offer babysitting services or referrals. You can also try Boston’s Best Babysitters and Nanny Poppins.